Important biblical map of Lebanon by the founder of 'Palestinology'. 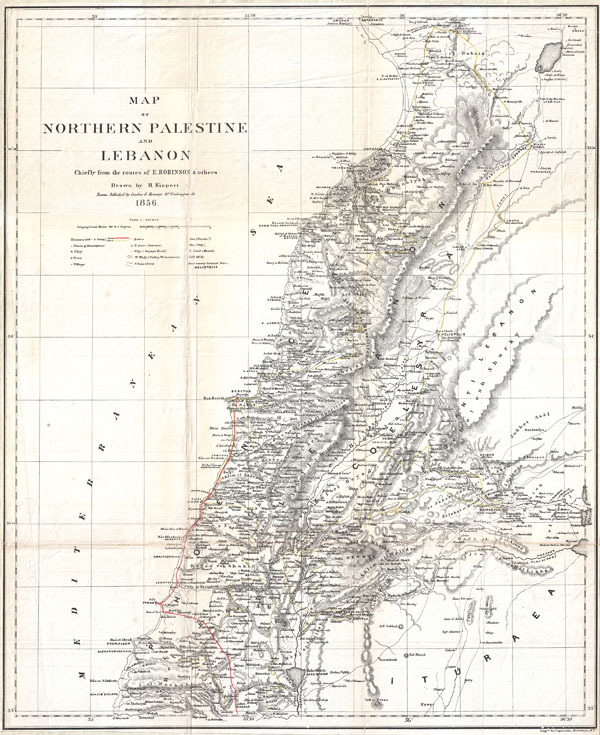 Map of Northern Palestine and Lebanon Chiefly from the Routes of E. Robinson & others. An uncommon map of Lebanon by the classical scholar and cartographer H. Kiepert. Covers all of modern day Lebanon as well as parts of adjacent Israel, Palestine, Jordan and Syria. This map is based on the 1838 travels of E. Robinson and E. Smith in this area. Robinson and Smith, in search of unidentified Biblical sites, traveled throughout the Middle East but most particularly in modern day Israel, Palestine, Lebanon, Egypt, Jordan, and Syria. The duo used local traditions as well as established Biblical scholarship to identify a number of important sites. This map is largely the result of their research and work. Their route, shown in red, leads Israel northwards to Tyre then skirts the coast to Beiruit. Most place names are transliterations of Arabic though biblical references are included where appropriate. This map was drawn by Heinrich Keipert, a noted expert on historical cartography, for Robinson's important work Biblical Researches in Palestine, and in the Adjacent Regions. Good. Some toning on original fold lines. Margins all round narrow as issued. Blank on verso.